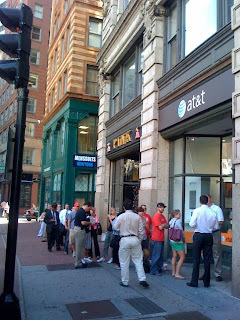 The Beantown Bloggery: 1000 Words - Want a 3G Iphone? Get in Line. 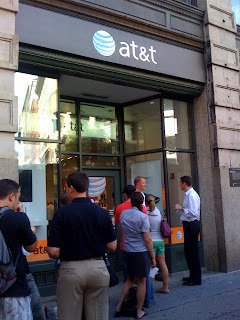 The line had already formed out the door at the at&t I walked past on my way to work. It was around 9am'ish when I walked past there, I can only imagine that the lines are going to get longer throughout the day until the stores run out of phones. Photos taken from the at&t in Downtown Crossing near the Financial District. 3 Response to "1000 Words - Want a 3G Iphone? Get in Line." I think there's something funky going on with this post. All the links open up golf ads for some reason. oops! Sorry - I connected to this blog through bostongal's and forgot I wasn't on her site anymore. didn't mean to address you as gal. No problem. I appreciate the comment. The golf ads were because of some new advertising service I was testing out that was supposed to add relevant text link ads to my posts. But clearly they're not relevant and are instead just being annoying, so I've removed them. Thanks for the input.